I thought this was pretty exciting, even if I am not pregnant…but if you are pregnant, you need to do this! Imagine how AWESOME it would be if you won! If you’re expecting a new baby, chances are that you’re registered at the go-to spot for all things baby- Babies ‘R Us. And even if you’re registering days are long behind you, we have a feeling you know some moms who are expecting a new little bundle of joy. If you fall into either of these categories, you’re definitely going to want to hear about the new Babies ‘R Us sweepstakes, sponsored by Baby Brezza, the makers of The Baby Brezza™ One Step Baby Food Maker! From January 13th until February 13th, you have the chance to win your entire Babies ‘R Us registry*, just by adding the Baby Brezza One Step Baby Food Maker to your registry. 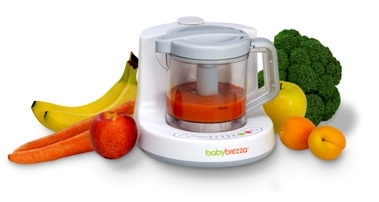 That’s right, one lucky mom-to-be will win her entire wish-list, including the Baby Brezza One Step Baby Food Maker! And trust us, this is one must-have that you’ll want to add to your list anyway, since it’s the only baby food maker that steams and blends in one simple step. hey, i was on diaper swappers, and wondered if you still have your shrinkx for sale? it's not letting me PM you because i'm too new a member. email me if you still have it! tracylittle (at) gmail.com thanks!